Below is a synopsis of the show, courtesy of Gypsy Productions. The play is bracketed by the misadventures of the naive Frederico, who arrives in Los Angeles during the first day of the 1992 riots and believes he's witnessing the filming of another Lethal Weapon sequel. He mistakes the looting for U.S. generosity. Other characters include Vinnie, a kept boy being asked to leave the home of his wealthy sugar daddy because he's turned 30; the Demon Roommate, a lonely young man with an apartment a little too close to the airport; Paco, a Cuban restauranteur who was imprisoned by the Communists in Cuba for being gay and has now been exiled by his right-wing Miami family for the same reason; and the Teacher, a stuffy, sexually repressed English-language instructor who abuses his Latino students when they can't learn properly the "language of Princess Di". Perhaps the most tragically comic character is aspiring actor Eduardo Troncos. Eduardo bleaches his skin, goes to trendy straight bars, and changes his name to Edward Thornhill III. 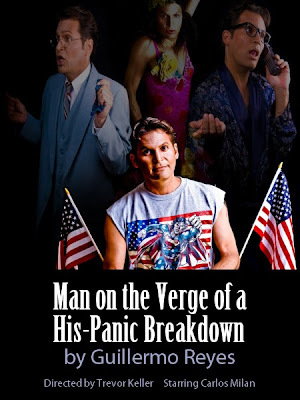 Edward, a Latino actor passing for Anglo who gets a Latino part, has to deal with his real identity when the producers tell him he is not Hispanic enough. The play ends with Federico's final misadventure as he tells of his newly found romance, a better job and his acquisition of citizenship in a grand, positive finale.